Several months ago I read Sawyer's Rose, Book 1 in The McCades of Cheyenne series, and I loved it. I must say that I think Wyatt's Bounty is even better. The McCade family is everything you expect an upstanding old west family to be. Although each brother is quite different, they are held together by a strong mother who puts up with no nonsense from her boys and a father who, even though he was killed years ago, left the boys with a strong sense of decency. 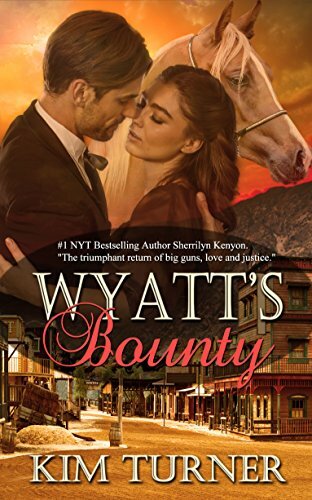 Wyatt has loved Doc Tess for years and when she rejects his proposal and tells him she is moving back east, Wyatt is so crushed he heads to Denver where his problems only get worse. Kim Turner shows us romance that will curl your toes, gunfights that will make you grit your teeth, and a love that will warm your heart. This may be a romance novel, but I'd be willing to bet that quite a few men would love reading this one. If you are even the slightest bit a fan of Westerns, you'll love this book. I actually listened to the Audible version of the book and although at first I wasn't sure if I cared for the narrator, his voice grew on me. He has that deep rugged voice you would expect from a man of the old west. Disclosure: A complimentary copy was provided by the author. A review was not required. All thoughts, opinions and ratings are my own. Thanks so much for having me on here and for reading and reviewing.